This Buying Power edition report reveals how providers who know the true cost of care are moving to contain costs, increasingly through process redesign and clinical/financial data integration. 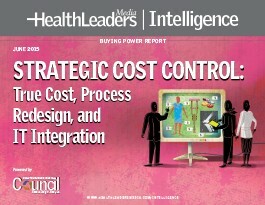 This report, Strategic Cost Control: True Cost, Process Redesign, and IT Integration reveals how the strategies healthcare organizations are employing to contain costs and better manage revenue cycle are changing in subtle but important ways. Driven by the impending transition to value-based care and the adoption of risk-based models, they are evolving beyond traditional purchasing and supply-chain efficiencies into process redesign and new IT initiatives.